Does not drastically reduce colour depth as does Matte Medium. 100% acrylic polymer varnish. Water soluble when wet. Good chemical and water resistance when dry. Will not crack as surface expands and contracts during temperature and humidity changes. Applicable for any acrylic painted surface (flexible and rigid) on canvas, paper, wood, stone, Plexiglas, etc. Flexible, archival, non-yellowing and water resistant when dry. Acrylic paintings must be completely dried and cured for a minimum 48-72 hours before varnishing. 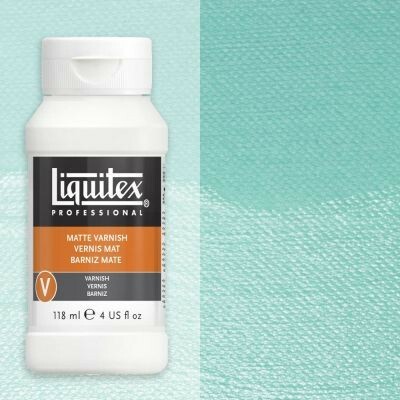 If more than 1 varnish coat is desired, apply 1-2 coats of Liquitex® Gloss Varnish before applying a final coat of Liquitex Matte Varnish.